Two months have now passed since Juan Guaido asserted himself as Venezuela’s interim president. Domestically, he has been unable to shake President Nicolas Maduro from power. But internationally, with U.S. backing, he’s making some headway. Guaido, the 35-year-old head of the opposition-run parliament, is riding on a wave of popular support as he tours the country on what he calls “Operation Freedom.” But there is no sign yet of him making good on his vow to “very soon” march up to the presidential Miraflores Palace in Caracas and take over. On Saturday, he was set to address a crowd in the northeastern city of Barcelona, after saying a day earlier that “we are calling for the phase of maximum public pressure” on the regime to go. The president’s supporters held their own counter-demonstration Saturday in the capital. On Thursday, his security forces arrested Guaido’s chief of staff, Roberto Marrero, on “terrorism” accusations, triggering an outcry from the European Union, the United States and other Latin American nations. But Maduro has been careful to leave Guaido himself alone, heeding U.S. warnings of “a significant response” were the opposition figurehead to be arrested. Both Guaido and Maduro claim to be constitutionally legitimate. 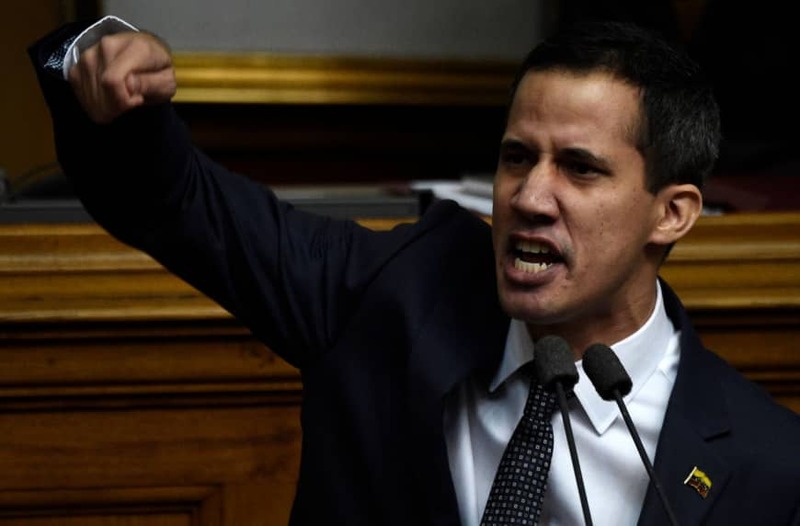 Guaido declared himself interim president on January 23, saying Maduro’s re-election last year was invalid because opposition figures were barred from running and boycotted the ballot. Inside Venezuela, Guaido has a 61 percent approval rating among the public, according to the polling firm Datanalisis. Maduro has only 14 percent. But it’s abroad that Guaido’s backing is more consequential. More than 50 countries recognize him as interim president, including, crucially, the United States and major E.U. and Latin American nations. Maduro, on the other hand, has China, Cuba, Iran and Russia on his side. The latter two are Venezuela’s biggest creditors, getting paid in the dwindling amounts of crude being exported. The dueling support between the U.S. and China spilled over Friday when the Inter-American Development Bank, which provides funding in Latin America, pulled its annual meeting out of China after Beijing refused to issue a visa to Guaido’s representative. Washington is reportedly trying to have Guaido’s envoys replace Maduro’s officials on other international bodies, such as the U.N. Disarmament Conference in Geneva, where Venezuela is due to take over the rotating presidency. U.S. President Donald Trump‘s government has also ratcheted up sanctions on Venezuela, most recently as Friday in reaction to Marrero’s arrest, and has frozen state accounts and assets on U.S. territory. That will be a major blow, as the U.S. is historically Venezuela’s biggest oil customer. But southern U.S. oil refiners are also dependent on the heavy grade, high sulfur variety of oil that Venezuela produces. Trump has reiterated that “all options” — including, it is inferred, military action — are on the table for Venezuela. However, U.S. troops were not used last month in a foiled attempt by Guaido supporters to truck U.S. aid in Colombia over the border into Venezuela. Cuando la duda nos debilite, recordemos que la ESPERANZA nació en Venezuela para lograr la libertad, para no morir más nunca. En todos estos años no doblegamos nuestro espíritu y fortalecimos nuestro amor por la patria. Despite being weakened by Guaido’s rise, Maduro “has managed to maintain surprising cohesion in such an adverse scenario,” analyst Mariano de Alba told AFP. The military, which controls politics and the economy, has shown “absolute loyalty,” ignoring calls by Washington and Guaido to abandon Maduro in return for amnesty, he noted. The head of the Datanalisis firm, Luis Vicente Leon, said the core of the military has not broken ranks “because there has been no credible offer which the military elite could trust” and troops fear being trashed in any change of regime. Meanwhile, Venezuela’s economy swirls deeper down the drain. Inflation is forecast by the IMF to top 10,000,000 percent this year. Once oil shipments to the US cease altogether, the country’s access to hard currency will be severely curtailed. “The economic situation is going to worsen a lot more, and the population will experience a substantial deterioration of quality of life,” de Alba warned. He said increased repression by Maduro’s regime would follow.